Eeeep! 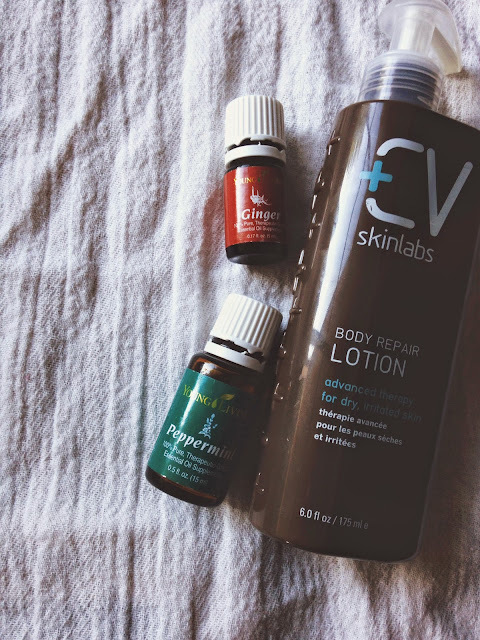 I haven't shared an essential oil benefits post in a while! No worries, this one will make it all up. Today I am talking about ginger essential oil, the king oil of "no nausea", especially if you partner ginger with peppermint. Ginger may not have the best of smells, it is the scent that is needed to rid a nauseous feeling. This is why ginger appealed to me because I get motion sickness almost every time I am a passenger in a car. It is a yucky feeling, and it lingers for several hours after the car ride. It is certainly not fun, and that is why I grabbed up ginger. I use ginger with a lotion, and rub it on my abdomen, and my chest. I can smell the spiciness of the ginger better that way, and you get used to the smell of pure, strong ginger. It is the oil of ginger, and it totally helps my car sickness. It is a fabulous oil. 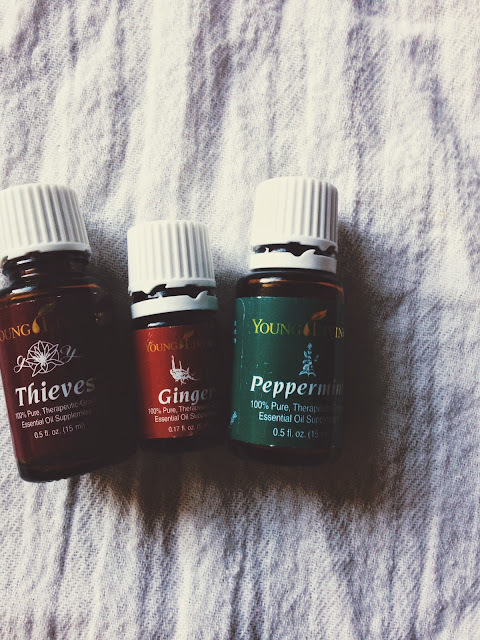 I recently had food poisoning, and ginger essential oil was my best friend, along with peppermint essential oil. I did not use ginger essential oil to prevent me to vomit, because when it is a bug, you just want it out of your system. I let it go! Throughout the night, I had ginger essential oil on me, and it helped big time. I later had a slight fever, and I used peppermint on my feet and abdomen to break it. Peppermint pulls out the heat. After my vomit bouts (that sounds horrible! food poisoning is horrible though, and all that goes with it), I was sore all over my body because of the trauma I had just been through. I was moaning through the night because I was so uncomfortable, and freezing, I was not in good shape. The next morning, on Friday, I rubbed ginger all over me, and the ginger essential oil soothed my sore muscles. It was like magic! I want to share this wonderful diffuser blend with you! I am just a mess lately, with stress, colds, school, the food poisoning, I needed some purification in my life. While Young Living has a blend called purification, that is not what I am referring to. I am referring to my own blend of peppermint, Thieves, and ginger. I have had a stuffy, runny nose for about 2 weeks now, possibly more, I have stopped keeping track of how long I have had this annoyance, but I made this blend up to purify the air, open my sinuses up a bit, and stop my runny nose. Thieves is wonderful to stop runny noses. It actually works! This blend is dynamite, it blows those germs outta there. 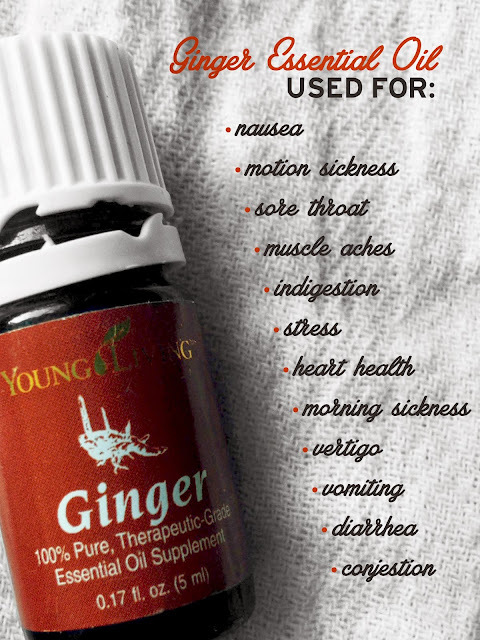 Ginger is also considered one of Young Living's "budget" oils, especially so if you are already a wholesale member. It has so many wonderful uses. So, in your time of unwanted nausea (when is nausea ever wanted? ), use ginger essential oil. It will settle your stomach quick, and you will feel back to normal. If you have any questions concerning Young Living essential oils, please comment or contact me. I would love to help you out!